Tomorrow is Thanksgiving Day. How will you spend it? Some will spend the day with family and friends, enjoying food, fellowship, and perhaps some football. Others will spend it alone. But regardless of your plans this year, let me encourage you to spend the day marinating a bit in what it means to live a life of thanksgiving to the One who has “blessed us with every spiritual blessing in Christ” (Ephesians 1:3). The apostle Paul tells us that overflowing thankfulness is the mark of Gospel-soaked saints, regardless of the cost or circumstance. And Paul knew hardship and suffering for the sake of the Gospel! He was no “ivory tower” teacher, comfortably distant from the message he proclaimed. You probably know that Paul wrote most of the New Testament; did you know that he penned most of his inspired epistles from behind prison walls? Regardless of the circumstances he faced, Paul was marked by overflowing thankfulness because He intimately knew the One to whom he was so thankful. Here is the man who was transformed from Saul, persecutor of the Church, to Paul, a pastor in the Church. He who hated Christians became a helper of Christians. The murderer became a minister, and Paul engaged in that ministry until his very last breath. He did it in the face of incredible hardship and opposition, yet his heart always overflowed with thankfulness. So, throughout this Thanksgiving weekend, let us pause and count our many blessings. Don’t bother to try to “name them one-by-one,” as the Bible song says, because there are far too many to number. We simply need to be “Living Thanksgiving,” living a life of heartfelt gratitude, sharing the love of Christ with everyone we encounter. Share the love of Christ by telling someone about the His amazing grace and incomprehensible love. Share that love, with both your lips and your life. Who can you reach out to this Thanksgiving week and tell them how much they mean to you? Make that long overdue phone call. Share that past-due hug. Write that note of appreciation you have been meaning to write for as long as you can remember. 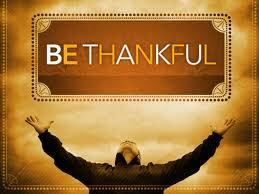 God will be glorified, your soul (and the other person’s) will be enriched, and you will be living Thanksgiving!